Here we set up a GestureRecognizer object with a collection of input event handlers for processing both pointer and gesture input. For more information on how to listen to and handle Windows Runtime events, see https://docs.microsoft.com/windows/uwp/xaml-platform/events-and-routed-events-overview. See the Basic input sample for the full implementation. // subset of these events. // Set up pointer event handlers. These receive input events that are used by the gesture recognizer. // Route the pointer pressed event to the gesture recognizer. // The points are in the reference frame of the canvas that contains the rectangle element. // Route the pointer moved event to the gesture recognizer. // Route the pointer released event to the gesture recognizer. // Route the pointer canceled event to the gesture recognizer. You can create a gesture object for each appropriate element when your app starts. However, this approach might not scale well depending on the number of gesture objects you need to create (for example, a jigsaw puzzle with hundreds of pieces). In this case, you can create gesture objects dynamically on a pointerdown event and destroy them on an MSGestureEnd event. This approach scales well, but does incur some overhead due to creating and releasing these objects. Alternatively, you can statically allocate and dynamically manage a pool of reusable gesture objects. For more detail on how to use cross-slide functionality, see Guidelines for cross-slide. The threshold distances used by the cross-slide interaction are shown in the following diagram. The PivotRadius and PivotCenter properties are used only when single pointer input is detected. They have no effect on multiple pointer input. The value for these properties should be updated regularly during the interaction. Rotation is supported by a GestureRecognizer only when manipulationRotate is set through the GestureSettings property. Rotation is not supported for single pointer input if the value of PivotRadius is set to 0. Initializes a new instance of a GestureRecognizer object. Gets or sets a value that indicates whether manipulations during inertia are generated automatically. Gets or sets a value that indicates whether the exact distance from initial contact to end of the cross-slide interaction is reported.By default, a small distance threshold is subtracted from the first position reported by the system for cross-slide interactions. If this flag is set, the distance threshold is not subtracted from the initial position. This distance threshold is intended to account for any slight movement of the contact after initial detection. It helps the system differentiate between cross-sliding and panning, and helps ensure that a tap gesture is not interpreted as either. Gets or sets a value that indicates whether the cross-slide axis is horizontal. 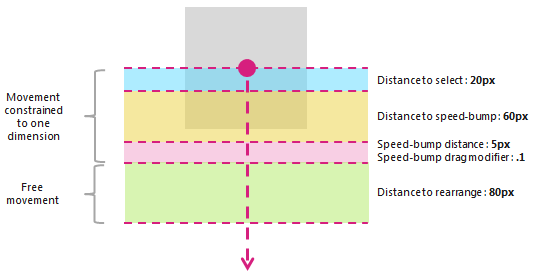 Gets or sets values that indicate the distance thresholds for a CrossSliding interaction. Gets or sets a value that indicates the gesture and manipulation settings supported by an application. Gets or sets a value that indicates the relative change in size of an object from the start of inertia to the end of inertia (when resizing, or scaling, is complete). Gets or sets a value that indicates the rate of deceleration from the start of inertia to the end of inertia (when the resizing, or expansion, manipulation is complete). Gets or sets a value that indicates the final angle of rotation of an object at the end of inertia (when the rotation manipulation is complete). Gets or sets a value that indicates the rate of deceleration from the start of inertia to the end of inertia (when the rotation manipulation is complete). Gets or sets a value that indicates the rate of deceleration from the start of inertia to the end of inertia (when the translation manipulation is complete). Gets or sets a value that indicates the relative change in the screen location of an object from the start of inertia to the end of inertia (when the translation manipulation is complete). Gets a value that indicates whether an interaction is being processed. Gets a value that indicates whether a manipulation is still being processed during inertia (no input points are active). Gets or sets a value that indicates whether the exact distance from initial contact to end of the interaction is reported.By default, a small distance threshold is subtracted from the first delta reported by the system. This distance threshold is intended to account for slight movements of the contact when processing a tap gesture. If this flag is set, the distance threshold is not subtracted from the first delta. Gets a set of properties that are associated with the wheel button of a mouse device. Gets or sets the center point for a rotation interaction when single pointer input is detected. Gets or sets the radius, from the PivotCenter to the pointer input, for a rotation interaction when single pointer input is detected. Gets or sets a value that indicates whether visual feedback is displayed during an interaction. Identifies whether a tap can still be interpreted as the second tap of a double tap gesture. Causes the gesture recognizer to finalize an interaction. Processes pointer input and raises the GestureRecognizer events appropriate to a pointer down action for the gestures and manipulations specified by the GestureSettings property. Performs inertia calculations and raises the various inertia events. Processes pointer input and raises the GestureRecognizer events appropriate to a mouse wheel action for the gestures and manipulations specified by the GestureSettings property. Processes pointer input and raises the GestureRecognizer events appropriate to a pointer move action for the gestures and manipulations specified by the GestureSettings property. Processes pointer input and raises the GestureRecognizer events appropriate to a pointer up action for the gestures and manipulations specified by the GestureSettings property. Occurs when a user performs a slide or swipe gesture with a mouse or pen/stylus (single contact). Occurs when a user performs a press and hold gesture (with a single touch, mouse, or pen/stylus contact). Occurs when the input points are lifted and all subsequent motion (translation, expansion, or rotation) through inertia has ended. Occurs when all contact points are lifted during a manipulation and the velocity of the manipulation is significant enough to initiate inertia behavior (translation, expansion, or rotation continue after the input pointers are lifted). Occurs when one or more input points have been initiated and subsequent motion (translation, expansion, or rotation) has begun. Occurs after one or more input points have been initiated and subsequent motion (translation, expansion, or rotation) is under way. Occurs when the pointer input is interpreted as a right-tap gesture, regardless of input device. Occurs when the pointer input is interpreted as a tap gesture.